What's that? Timmy's stuck in the well? 1. 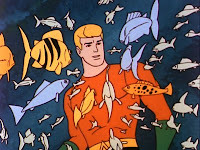 Aquaman A comic superhero with the powers to swim, breath under water, and talk to fish. He helps save drowning women and fights ocean pollution. He will never be made into movie, be noticed, or get readership. "Quick Aquaman, the city's in trouble, go swim to Batman's beach house and get him to help!" Somewhere, some few people claim to like Aquaman. They are the 1%. And they don't work at DC. In DCUO, he is the only hero who does not help you in any storyline, does not offer advice. In fact, he is the only hero whom, as a hero, you get to beat up on. You get to kick Aquaman's arse while he throws giant crustaceans at you because he had been ensorcled by Circe. In Batman: The Brave and the Bold, Aquaman is an idiot, constantly disrespected by his colleagues. Does anyone remember the TV show? (I see you there, Lou Diamond Phillips). 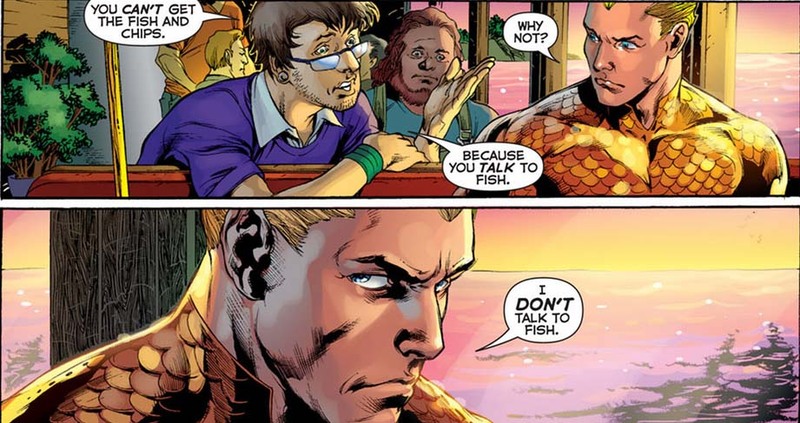 I am one of the many who often LOLs at Aquaman and his ability to talk to fish. I wasn't overly interested in reading Aquaman #1 from The New 52, but my friend's review intrigued me. Plus, I figured their would be ample opportunity for more LOLs. I had no idea that every single LOL that Aquaman has suffered through the ages would be expressed in this one issue. The book opens with a bank robbery that Aquaman boldly stands up to, with the robbers escaping in a Brinks van heading straight for him. They most certainly don't slow down when they realize who it is. They just laugh and go faster. 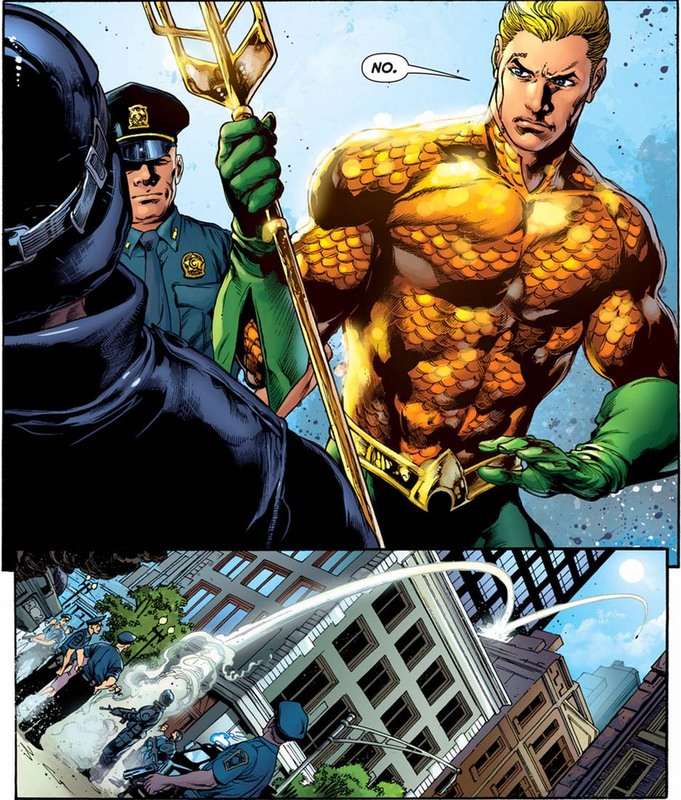 We then witness some of Aquaman's other powers. The ones that many of us didn't realize existed because we're tainted by the Super Friends lore that rendered Aquaman basically useless. 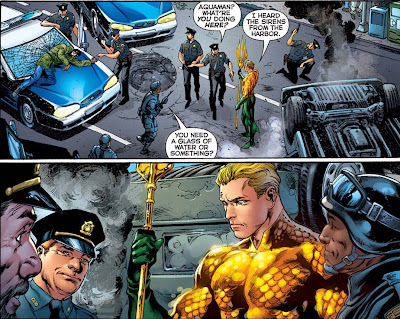 Instead, we see Aquaman not even flinching as he flips the van over with his super strength and mighty trident. He only gets slightly annoyed when one of the many bullets that bounce off of him draws a trickle of blood. Now you're suddenly thinking hey, he could totally take on Namor after all! The robbers are no longer laughing, but that's okay. Because the cops have taken over. There's no "Thanks for helping us out, Aquaman!" Gratitude would get in the way of the utter disrespect. Cop: Do you need a glass of water or something? Aquaman's annoyance and frustration turns quickly to anger when the blogger asks him how it feels to be no one's favourite super hero. Aquaman flounces again, though this time, with less show, and heads off to the lighthouse where he informs his wife Mera that he doesn't want to be King of Atlantis anymore. Apparently, he just wants to live a normal life among the people who consider him so much of a laughing stock that they can't even bother to thank him for helping them out. Awwww. Fortunately, a viscious evil is emerging from the depths, ensuring that Aquaman's plans for domesticity will not last. I can only assume that, in the upcoming issues, writer Geoff Johns plans to turn around all these jokes and give us the Aquaman that he deserves to be. I'd like to hope the plan isn't that obvious, but at the same time, the only other direction to go is having Aquaman commit suicide. We don't want that now, do we? So, cup half full, this must be the master plan, with the prevailing logic being to get all the jokes out of the way and make us feel bad for making them, because Aquaman, like Superman, has feelings, too. And we have hurt them for too long! 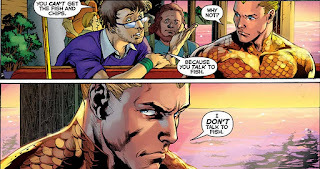 Unfortunately, feeling bad for hurting Aquaman's feelings is not quite the same as pitying him, which is what I actually felt after reading issue #1. I felt sorry for him, not merely because he was so pathetic in the eyes of the people, but because Johns decided that he had to take almost the entire issue to get this heavy handed point across. 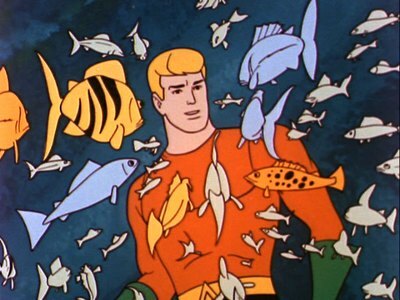 I pitied him because, with all the jokes there to overshadow everything, we got no actual idea of who Aquaman is and what personality lies behind those goldfish scales. All we know is that Aquaman is a sad panda whom everyone laughs at. And oh yeah, he has some powers other than that fish talking stuff. He kicks their asses, and eats them for dinner, too.